Alex Gdovin died from a punch to the chest that stopped his heart in a boxing match. In researching the early days of the Ingleside and Ocean View neighborhoods, one comes across innumerable references to "road houses," gambling dens, dog and horse tracks—all operating on what was considered the fringe of San Francisco. It's easy to imagine these haunts in colorful, romantic terms: gentlemen in bowler hats and handlebar mustaches, chomping on cigars and playing cards between shots of whiskey. But the darker side of the businesses that operated outside the law becomes clear with just one personal tragedy. Gabrielle O'Connell-Merel's ancestors came to Ocean View from Austria in the late 1800s, and she has been kind enough to share a sad story still remembered today by her family. Alexander, the patriarch of the Gdovin clan (often shortened to "Dovin" soon after arrival) made a living as a cigarmaker. He and his wife Anna lived in Ocean View in the 1890s at 315 Plymouth Avenue (now 335 Plymouth). They raised their five children and attended St. Michael's, the local catholic church. On the evening of February 5, 1906 the couple was urgently called to the small suburb of Colma, and at the White House saloon they found their eldest son Alex—just 20 years old—dead. "'I was startled by the news,' declared [Billy] Roche, 'and said at once that the report could not be true, as I had not received a permit for a fight in my club, and did not know that a bout was to take place.'" Worst of all, ringside at this illegal lineup of three fights that "nobody" arranged sat the Colma constable who allegedly shared in the box receipts. (He said some enemy of his had purposely misinterpreted a joke he made.) His deputy acted as referee for the match, and said he didn't know who organized the event, though he speculated perhaps it was the fighters themselves. 1. 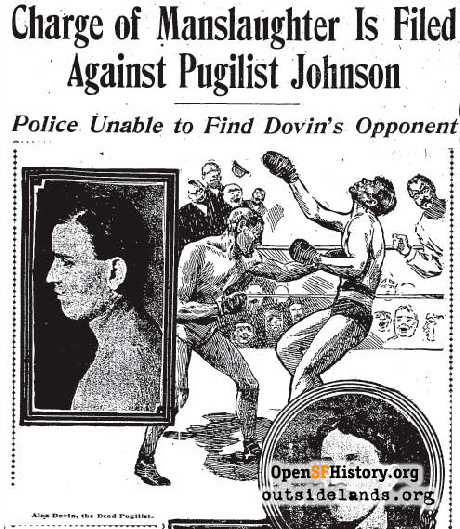 "Pugilist Killed in Fight at Colma," San Francisco Chronicle, February 6, 1906, pg. 1. 4. "Young Pugilist Weeps Over Friend He Killed in Fight", San Francisco Examiner, February 7, 1906. 5. "Charge of Manslaughter Is Filed Against Pugilist Johnson," San Francisco Chronicle, February 7, 1906. 6. San Francisco Chronicle, February 6, 1906, pg. 1.